Celebrated tour expert and cultural activist Carlos Celdran is pushing for pedestrianization around downtown Davao. “I really think Davao is ready for a pedestrian culture.” Celdran said. Known for his elaborate walking tours around the walled city around Intramuros in Manila City, Celdran said that Davao has the basics to start a walking culture. He cited clean and peaceful streets, a vibrant downtown area and the presence of public parks. The tour took the popular and controversial Manila personality around several Davao streets using the Apo View Hotel Street Map a customized city guide created by Apo View Hotel. Celdran’s trip was also initiated and organized by Apo View, one of the oldest hotels and located within the city’s downtown district. “We want to bring back the old Davao, the history and the culture.” Says Chris Pamintuan, general manager of the Apo View who bared that they are planning to start the downtown Davao walking tours with the hotel, one of the city’s oldest hotels as the starting point. He noted that many Dabawenyos are more preoccupied with going to the malls, Pamintuan hopes the project would revitalized the downtown area. “Carlos is the best guy for this thing.” Pamintuan said of the project which involves Celdran touring downtown with his trademark hilarious eccentricity which made him popular in Manila. Pamintuan said a video will be produced from the tour and hopes it would go viral in the internet. Already Celdran’s post on his social media sites about his Davao tour have attracted considerable interest in the project. The hotel general manager who is also a cousin of Celdran said that the City Tourism Office is very interested in the project and in fact assisted Celdran’s city tour. 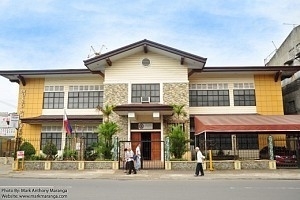 Celdran explored some of the city’s important cultural and historical attractions which included Museo Dabawenyo, Davao Cinematheque, San Pedro Cathedral, Rizal Park and old houses in the downtown area. Celdran said that Roxas Avenue has a potential to become a pedestrianized boulevard. He said that the city government can widen sidewalks, put bike lanes and upgrade public parks such as Osmena Park.